Ampelofassoula are the fresh green green beans (Vigna unguiculata) also known as cow peas, also called louvi in Cyprus. These beans are eaten before they mature,usually boiled and eaten as a salad with olive oil and lemon juice. When they ripen the shell becomes hard and the seeds are taken out of the shell and dried. These are the well known black eyed beans which are not only delicious but also a rich source of protein. During our last visit to Sparti, we had the chance to visit Southern Laconia, see some new places and revisit some others we had visited in the past. There are so many places one can visit but a one-day excursion is not enough to see everything.Our destination was Elafonissos with a couple of stops and on our way back we would visit Monemvassia. On our way to Elafonissos we stopped at Plytra for a cup of coffee. Plytra is a small tourist village by the seaside. This is where my sisters in law usually pass their summer holidays and one of my SIL has bought a plot there, where she plans to build a house soon. The last time we visited was over ten years ago and then we had the chance to swim in its beautiful beaches. I remember that we could see some ancient ruins in sea. We also stopped at Archangelos, which is another lovely small village by the sea, perfect for vacation. Archangelos is located on the beach, at the south end of Xyli bay in the Lakonian Gulf. Reaching towards Elafonissos there is another ancient submerged town, Pavlopetri, which is thought to be the oldest submerged town in the world. The main part of the town lays about 200 meters southwest of the islets that are opposite of the channel and 70-100 meters away from the coast of Pounta. The ru­ins, as re­search­ers say, date from at least 2800 B.C. to about 1180 B.C. It was discovered about 40 years ago and surveys are still being carried out and are expected to be published around 2012. Pavlopetri submerged after a major earthquake (7 – 8 Richter) around the 4th century b.C. The same earthquake affected Plytra and separated Elafonissos and the castle of Monemvassia, from the mainland. We took the ferryboat to Elafonissos, which is about 8 minutes to reach. Elafonissos, meaning island of deer, took its name because of the rich hunting of red deer (cervi) from antiquity to modern times. It may not be one of the most famous Greek Islands, as it is a very small one (only 19 square kilometres) but has some fantastic beaches worth visiting and you will eat the best fresh fish, as it has one of the biggest halieutic fleets in Lakonia. We arrived at Elafonissos around noon so we wanted to go swimming first and then have lunch. As you may see from the video, the beach has beautiful sandy beaches with crystal blue waters. The most famous beach is called Simos but we did not go there as it is more crowded. 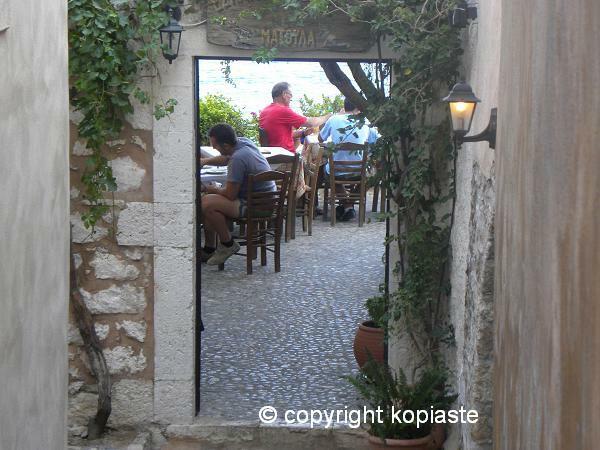 We preferred Panagitsa, which is equally beautiful and there are some lovely restaurants where you can eat. We were not disappointed with the food where we ate fresh fish. Returning from the beach we left our things in the car and walked to the restaurant.Unfortunately I do not have pictures of the food as I forgot the camera in the car but we ate fish and one of the salads was ampelofassoula, so today’s post is about fried fish and ampelofassoula. On our way back we made a small detour and visited Monemvassia. Monemvassia is a medieval fortress with an adjacent port town on the south-eastern Peloponnesian coast. It is a 13th century Byzantine village built on a rock that people sometimes called “The Gibraltar of the East” or “The Rock”. From the port village, there is only one entrance to the “rock,” or sometimes called “The Castle.” Monemvassia in Greek means “Single Entrance” this is because there is only one way that someone can enter it by land. The rock is 300 m tall and 1.8 km long. It is connected to land by a causeway. Many years ago there used to be a portable wooden bridge connecting it with land. Outside the main entrance there is a parking and from there you have to walk in the narrow, cobblestone pathways with its houses, lodgings, hotels, shops, souvenirs, bars, restaurants and also cafeterias and most of all enjoy the fantastic view. I have put together a video with some of the photos I took and hope you like it. Enjoy! Ampelofassoula are the fresh green string beans, called louvi in Cyprus, which later become the black eyed beans but before the seeds get fully developed. The name ampelofassoula is a composite word from ampelo (vigna = vine) and fassolia (beans), as it is climber. There are various varieties of this species: the regular ones which I have cooked are around 20 cm long and some very long ones, which are about 50 cm long. There are also a few other varieties, some times fatter or thinner and in different shades of green. These beans are harvested from May to July. When picked early and are tender they need little time to be cooked. As they get harder at the end of the season, their shell becomes tough and is not edible, but by that time the seeds grow and can we then cook only the seeds. No recipe is needed for ampelofassoula salad because all we need to do is snap their ends. If it comes off with a string, the string has to be removed. Then you boil them for 10 – 15 minutes, depending on how tender they are. We then drain them and put them in cold water so that they do not cook further. For a plate of salad you will need about 300 grams of green beans. I always buy more, wash them, dry them, put them in zip lock bags and store them in the deep freezer. The most traditional version of this salad is to boil the beans and the only thing you need is olive oil, salt and lemon juice or a vinaigrette, optionally adding some finely chopped parsley or dill. When I have pesto (I usually make it without cheese), I also love mixing it in the warm salad. They can also be stewed like all other types of green beans and any way you cook them, you will not be disappointed. 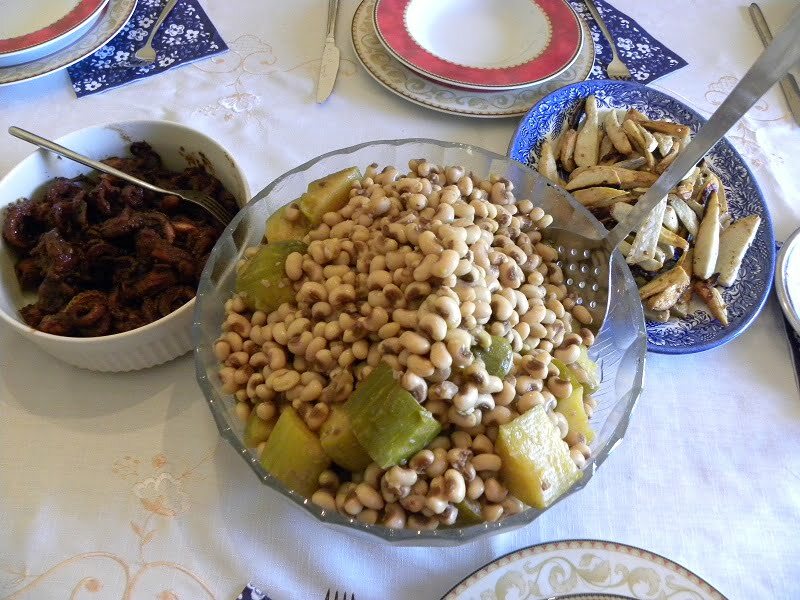 Today I am posting the Cypriot recipe, which is called Louvi Fresko (fresh beans before they are dried) with Kolokoui. Kolokoui is a type of marrow, the variety of which is called palkapa in Cyprus. You have to ask for it as “glykokoloko”, which means sweet marrow. As in Greece, where I live, I’ve never seen this variety, I usually make this dish with regular courgettes (zucchini). However, recently I have found a similar variety in Nafplio, which is called “politiko”. Prepare the beans: snap off its ends off and cut it into 5 – 6 cm pieces. If it is tough, just cook the seeds. Wash and drain. Wash and cut the marrow into smaller pieces about 3 – 4 cm. Put the beans in a pot with water and bring to a boil. Skim off any foam, if any. Cook for about twenty minutes, until almost soft. Add the marrow and salt and cook until soft, for about 10 – 15 minutes. Drain and add a couple tablespoons lemon juice. Serve with olive oil, more lemon juice, salt and pepper. Prepare the beans: snap off its ends off and cut it into 5 - 6 cm pieces. If it is tough, just cook the seeds. Wash and drain. Wash and cut the marrow into smaller pieces about 3 - 4 cm. Put the beans in a pot with water and bring to a boil. Skim off any foam. Add salt and cook for about twenty minutes. Add the marrow and cook until soft, for about 10 - 15 minutes. Drain and serve with olive oil, lemon juice, salt and pepper. I have told you in other posts that we have been eating a lot of fish such as fried cod, fried anchovies or marida (spicara smaris) which is picarel. Marida, like other small fried fish make a simple but very tempting dish. You need to follow a few basic rules to get it absolutely right. In order to achieve a golden and crisp crust outside you must make sure that the olive oil is very hot when frying and not to overload the frying pan. Although the fish mongers in Greece will tell you just to wash the fish, then coat and fry, I remove the guts and scale the fish, although there is not much to remove. This is up to you. The head and tail are edible. The oil should be enough to cover the pan, at least 2 cm and leave the oil to heat, just before smoking point, put in the fish. We know when the oil is hot enough by just putting my hand over the pan. If you can feel the heat coming from the pan, this means the oil is ready. Alternatively, if you have doubt, heat the olive oil for 3 – 4 minutes, then just put one fish in the pan and wait until you hear it sizzle and then add the remaining. When you add the first batch do not mix until they are cooked on the one side and then turn on the other. I also fry fresh bakaliaros also call bakalaos (cod) the same way. Actually, I don’t know why we call it bakalaos (which is the spanish name of cod) because it’s not actual cod but the European hake (Merluccius merluccius). I choose small cods, which however are scaled and gutted before coating with flour and then frying. Wash and remove the guts. Mix the flour with more salt and coat the fish. Serve while hot with some lemon juice. Serve them with your favourite salad or with fried potatoes (again fried in olive oil). The Fresh Black Eyed Bean Salad goes to Weekend Herb Blogging, hosted by Cinzia. This event started by Kalyn and now is continued by Haalo. Thank you for the wonderful post! That is such a beautiful place and that beach is perfect! a great dish and a wonderful photos! I have never eaten this fish before but it sounds wonderful so does the salad. You are so lucky to live in Greece, it’s such a beautiful place with such a rich history. Love the bean salade and beautiful pictures ivy. Ivy,Greece is such a dream !! I warn you that when I’ll finally visit your wonderful country you’ll be consulted often !! Great recipes !! I’ll have to try the green been salad, especially since I grow my own beans in the summer. I’m always looking for different recipes. Your photos are beautiful! It does make me want to get in the car and explore more of Greece. After a rainy day like today it was good to see a lovely summer dish. I could almost feel the sun as I was reading it! Your trip sounds wonderful! Your pictures attest to it … more of these posts make me miss Greece more and more! We have these small fishes here where I live; usually here they prepare them as meatballs which is alot of work so I rarely bother. I like this preparation. I will try it Ivy! Thanks for sharing! What beautiful pictures! If I ever have the chance to visit I don’t think I’ll ever want to leave! The string beans and fried fish look real good – I’ve never had fish this way. Hi Ivy always a pleasure to see some photos of greece !! I have been there when I did back bag !!! These are fabulous destinations I would love to visit especially Pavlopetri and the medieval fortress, how neat! Gorgeous pictures! You’ve triggered fond memories of my visit to Laconia. I really like the Neapoli peninsula and I will go back just for Kythera and Ellafonissos. Aren’t marida, gavros, atherina wonderful? All the better paired with ampelofassoula! This is what I needed today, being in Holland and looking outside where it is grey, raining and cold! We made a trip this summer to Laconia and we loved it, we stayed in Elafonissi for two nights and just loved the beache and the sea. So clear and clean and the restaurants are beatifull as is the food. A very good place to relax and the people are very friendly. Beautiful beautiful Greece & a delicious recipe. Keep posting the pictures Ivy, & keep me dreaming.. I will have to make this come true one day. Sorry I am late but had a very busy week. What a nice trip, Greece is really wonderful, you are lucky to live there! Thanks for participating, have a nice w.e.! Thanks for this fabulous recipe. ……….